Adam Carlson (Jelly Bean) had long thought about getting in the arena and performing as a funnyman and in 2011 he decided to start working towards his dream. 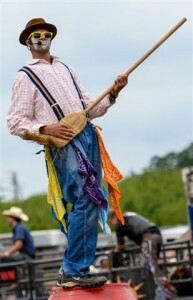 Jelly Bean will be the funny man at this years Winner Elks Rodeo July 28, 29 and 30 at the Tripp County rodeo arena. By the summer of 2012, he was able to start performing in different areas in North and South Dakota, Wisconsin, Missouri and Minnesota. He has been chosen to work the Minnesota high school rodeo finals twice, the Midwest bullriders final, the Rice bullriding glory bound tour finals and the WOJO rodeo circuit finals twice. Adams is on his 16th year of teaching health and physical education along with coaching varsity track and Special Olympics at Aitkin High School. He tries to use humor every day to get his lessons across to his students. When not working at chasing the rodeo dream, he and his wife and four kids enjoy horseback riding, camping, playing on the lake, watching the kids compete in different activities and relaxing. He is looking forward to meeting people in Winner.